One of the most famous trek route of Kashmir is the Tarsar Marsar trek which gives a clear sight of the twin lakes Tarsar and Marsar which is surrounded by the peaks of Kolahi Mountain. The highest peak of the Tarsar and Marsar trek is 13,500ft.which is a moderate level trek route. Aru is a small village in near Pahalgam, which is just 12km away from the Pahalgam. From Srinagar, the village is at a distance of 3-4 hours which can be travelled by cab. Trekking has emerged as a fascinating adventure sport in the recent years. People are going crazy over the thought of exploring the trek routes to reach a destination. The northern Himalayan region of India has some of the very famous trek routes which attracts many adventurous junkies every season. The trekking region of the Himalayan range covers the parts of Leh and Ladakh, Uttarakhand, Jammu and Kashmir and Kullu-Manali. The moderate trek route is famous for its explicit beauty of the surrounding and the view of the beautiful lakes surrounded by alpine trees. Tarsar and Marsar lakes rests at the Aru district of Jammu and Kashmir which are quite fascinating due to their almond shape. The lakes are separated by a mountain and flows in the opposite direction where the Tarsar Lake joins the Lidder river of Lidderwat and the other side flow towards Aru district. Due to the less height of the peak, an amateur trekker with the love for nature can easily complete the journey. The summer months from July to September is the best time to visit the Tarsar Marsar as the alpine trees form a radiant sheet which reflects on the water. This 7 days long Tarsar Marsar Package tour will give a chance to the nature lovers to embrace its beauty. Heading from the Aru district the trek will give a glimpse of the beautiful twin lakes and the luscious greenery of the valleys which surround the area. The trek will also give a golden chance to set the camp just beside the lake to wake up seeing the beautiful alpine meadows and the pristine lakes. This trek is the best for the first timers as it takes less physical effort to climb and reach the peak. On your arrival at Srinagar, the capital city of Jammu and Kashmir you will depart for Aru District at 2 pm. Before we leave for the basecamp you can always take a tour to witness the surreal beauty of Srinagar. The city is famous among the tourists for its beautiful artefacts and houseboats called “Shikara” on which you can admire the beauty of the Jhelum River. As there is no proper gravel road which connects Srinagar to Aru Village, thus we will pass through Pahalgam which is a very famous destination at Anantnag. Pahalgam is situated at a distance of 100km from Srinagar which takes 3 hours to reach. To reach the base camp before the sun sets we will depart from Srinagar at 2 pm. There are two routes towards Pahalgam, one passes through Anantnag and the other one through the Bijbehra. To experience the real beauty of the valleys in Kashmir we will drive through the Bijbehra route. On this route, you will get to see the beautiful phase of the Rural Kashmir lined with the apple orchards, walnut and apricot trees. From Pahalgam, Aru is at a distance of 12km which will take another one and a half hour. Situated on the banks of Lidder River, you will be astonished to see the beauty of this small little village ornamented with lush green meadows and alpine trees. On the first day of the trek, Aru village is the base camp where you will spend the night in the tents set across the river bank. As the morning sun rises we will start our trek from Aru to Lidderwat which is at a distance of 9-10kms. To reach Lidderwat we will follow the trial of the Lidder River which will take us to the village located at the uphill. The journey to Lidderwat will give a small peak to the lifestyle of Gujjars and the Fir forests which covers the area. Just as we will cross the forests you will come across the sight of Gujjar huts laid in the area which gives a cue of the Lidderwat area. To experience the true side of nature and the starlit sky we will set the camp on the streamside. One can also stay at the buildings built by the (Pahalgam District Authority). But for experience, the real adventure camping is a better option than lodging. To admire the beauty of the place you can take a walk around the riverside and return to the camp for night stay. After spending the night under the stars, we will cover a distance of approximately 6-7kms on the 3rd day. The trek will start from the PDA huts following the trial of the Lidder River to reach the pine forests. We will sit inside the Gujjar huts to enjoy a cup of tea with some snacks before we get back on our journey. As we proceed on our trek, the ascent will become steep due to increase in altitude. The camp will be set on the Shekwas meadowland for the night. Today we will head towards the Tarsar Lake which is the main attraction of this trek. The trek will start from the Shekwas meadow from where we will ascend 5kms towards the Sumbal. In this route, you will experience a lush green patch of grassland. Later we will follow the ridge to the stream which will head towards Tarsar Lake. After a journey of few hours, you will be surprised to witness the enigmatic view of the almond-shaped lake from the conical hilltop. After experiencing an adventurous journey of crossing the stream through rocks and boulders you will reach the beautiful Tarsar grassland where you will set the camp for the night. The day 5 will add some thrill and adventure to the trek as we will cross the Tarsar Pass which has an elevation of 13.500ft. The distance from the Tarsar lake to Sundersar is 5Kms approximately which will be covered in 5-6 hours. After crossing the ridges and meadows you will see the beautiful view of the Sundersar Lake surrounded by luscious green landscapes. For the night the widely stretched landscapes at the bank of Sundersar lakes is a perfect location to set the camp. To reach Marsar there are two passes to climb from Sundersar. The boulder laden trial pass is an easier path to reach Marsar on time. The trek from Sundersar to Marsar is a half an hour journey where you will also witness the beautiful green patches of grassland. After reaching the top of the ridge you will see the beautiful view of the Marsar Lake hidden behind the dollops of clouds and mist. The Marsar Lake rest 600-700 ft. below and appears just like the Tarsar Lake. As you enjoy the charismatic view of the Marsar Lake, head back down to Sundersar following the same route which will take approx. 40 minutes. Later you will head towards Homwas which is the last destination of this trek. The journey will start from Sundersar from where you will walk towards Shekwas to reach Homwas in an hour. As the day ends you will set your camp at Homwas to spend the last night gazing at the dark sky. On the last day of your trek, you will get the chance to explore the same route downhill which you had taken earlier via Lidderwat. The descending walk from Homwas to Lidderwat is a 2hours journey which will give you the view of the shrinking Kolahoi glacier which you may have missed while trekking to Tarsar Lake. While climbing down you will also witness the pine forests of Lidderwat. After you reach Lidderwat halt for a while to take rest and eat something from the small tea stalls. Later you will cover a distance of 10kms from Lidderwat to Aru which will take another 4 hours. As you reach the Aru village a ride will be arranged to Srinagar. How to reach the basecamp – Aru? 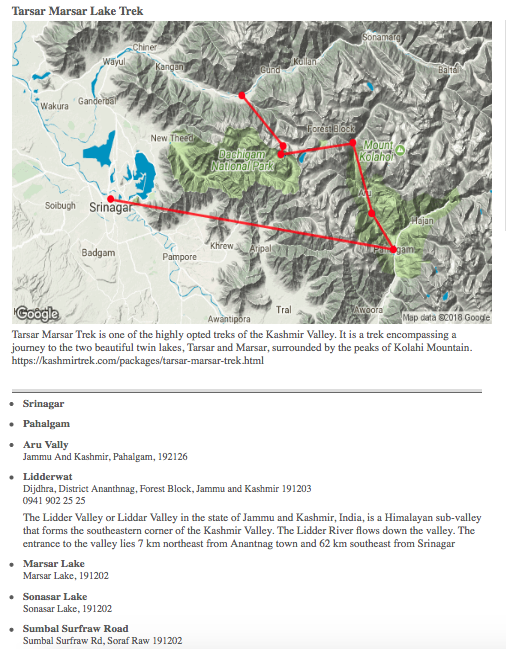 The Tarsar Marsar trek starts from the Aru Valley which is a famous tourist spot in the Anantnag District of Jammu and Kashmir. There will be a pick-up service arranged from Srinagar Airport at 2.30pm towards Aru district. For the pick-up service, non-AC Mahindra XYLO / Scorpio will be provided.The distance from Srinagar towards Aru is 107kms and it takes around 2 and a half hour to reach the beautiful Aru Valley. As the trek ends at Aru district, a transport facility will be provided from the valley to the Srinagar airport. You are expected to reach Srinagar till 8pm. We planned a trek tour to the Tarsar Marsar Trek which is a mesmerizing view to enjoy. Our group had four people in total and we booked our trek with Alpine Travels. From the starting of the trek to the end, they rendered a great service overall. The guides were very professional and had a well-versed knowledge about the insights of the Kashmir valley. We walked amidst the dense forests, conquered the highest peak of the trek tour and stayed in the camps. It was well planned and memorable tour for us. Kudos to the great team work by the Alpine travels! We had a great expedition on the high altitudes of the Kashmir trek and the great service by the Alpine travels made the journey much more fascinating. The best part of our holidays was Tarsar Marsar lake. “Highly recommend anyone who wants to see real Kashmir”.